For an overview of ticket fields and how they work, see About ticket fields. For information about the Ticket Fields admin page, and the actions you can perform there, see Managing ticket fields. 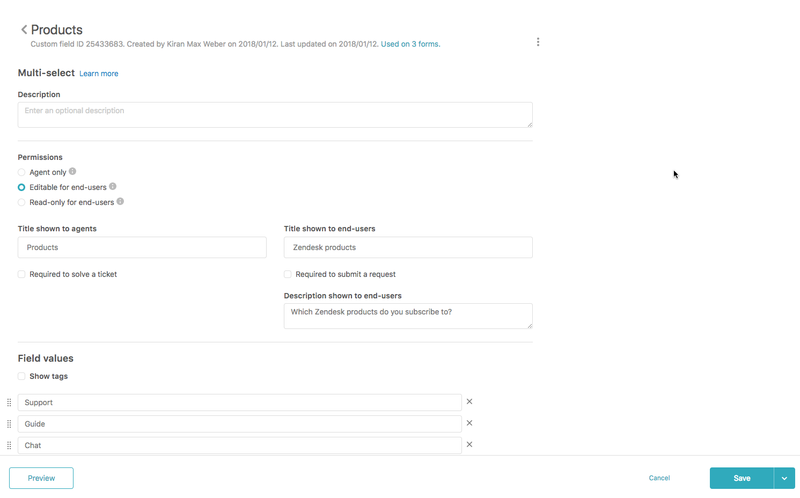 For information on creating ticket fields, see Adding custom fields to your tickets and support request forms. For system or other protected ticket fields, some of these tasks may not be allowed. On the Ticket fields Admin page, hover over the field you want to edit. Click the field options icon ( ) , and select Edit. The field’s edit page opens. You can edit some or all of the details in both custom and system fields. Not all ticket fields can be edited. Open the ticket field's edit page, as described above. When your changes are complete, click Preview or Save at the bottom of the page. If you want to temporarily remove a custom field created by you from a ticket, you can deactivate it. Deactivated fields can be reactivated when needed. Note: If you deactivate the Priority ticket field, Zendesk will block any SLA policies. See Setting up SLA policies for more information. Some system ticket fields, and some fields created via business rules, cannot be deactivated. Deactivated ticket fields are moved to the Inactive fields list, which can be viewed by clicking the Inactive tab on the Ticket Fields admin page. On the Ticket Fields admin page, locate the field you want to deactivate. Click the field options icon ( ) , and select Deactivate. The ticket field is moved to the Inactive fields list at the bottom of the page. In the Deactivate ticket field warning box, click Deactivate. The ticket field is moved to the Inactive fields list at the bottom of the page. On the Ticket Fields admin page, click the Inactive tab. Locate the ticket field you want to reactivate. Click the field options icon ( ), and select Activate. The ticket field is moved back to the Active ticket fields list. 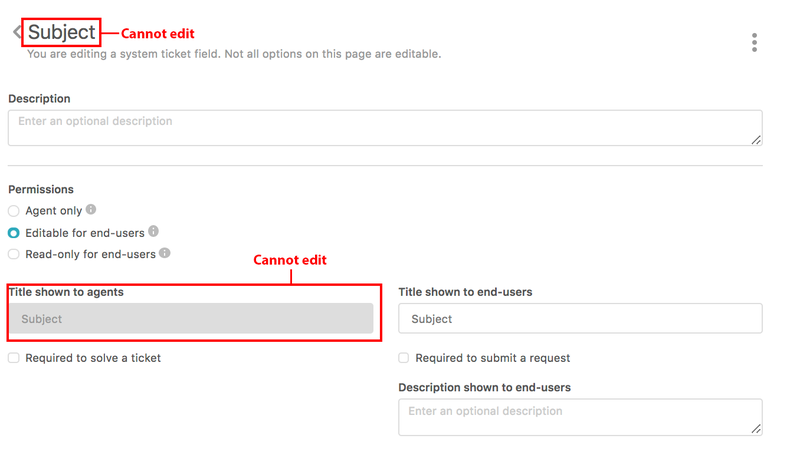 Note: You can also deactivate fields from their specific edit pages. You can delete any custom ticket fields created by you. However, system ticket fields cannot be deleted, and those created via business rules can only be deleted by editing the business rule. Click the field options icon ( ) in the upper right, and select Delete. When asked to confirm the deletion, click OK. The field is removed from your ticket fields list. Can fields be dynamic or have logic? For example, if I have a drop down of options to choose from and can each option create new and different fields to choose from? You'll want to look into the Conditional Fields App. which will allow for you hide and show ticket fields based on the previous fields selected. Keep in mind that this app is only available to customers on the Enterprise plan or if you have the Productivity Pack add-on. I've also attached our Using the Conditional Fields app which will walk you through step by step on how to set up this integration. We have Enterprise, so we should be good. Our use case is for HR, do you know what security risks using Conditional Fields poses? There wouldn't be any security risks as the app only hides the ticket fields from the UI until certain conditions are met. So there is no storing our data with another company? Thanks for your help Brett. That helps put my mind at ease. How can I show related articles for the custom field? Currently related articles are shown only for the subject field by default, but I want them to show for some other custom field instead. After user chooses sub topic - show him list of relevant articles for this sub topic.